Visiting Tuscany wouldn’t be complete without spending a few days in Livorno and meandering along the Etruscan wine and olive oil coast trail. We were fortunate to discover and to stay at Villa Cassuto, a very special property that would delight the cultured traveller with a taste for all things idiosyncratic. The villa is set in beautiful gardens, with spending views of the Mediterranean sea below. From the moment we set foot in, we were immersed in its world of rich historical detail and eclectic design narrative. Here, original marquetry furniture and massive carved wood staircase rub shoulders effortlessly with bohemian chic, and shelves of rare books exist happily alongside stacks of paperbacks on anything from poetry to world cuisine. 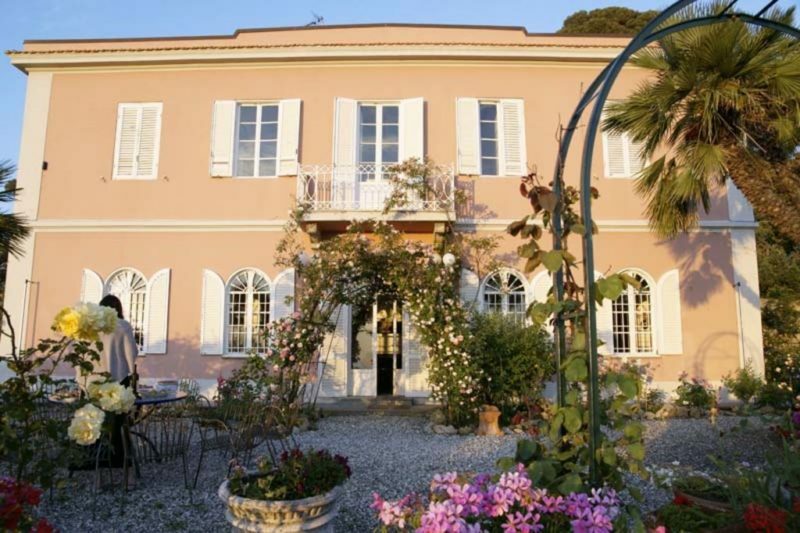 Villa Cassuto was the home of a prominent Jewish businessman and his wife, now functioning as a rather original B&B. Maintained by ample staff who tend the garden, the 5 bedrooms and cottage, and generally look after guests with old-fashioned courtesy, this is a grande old dame that breathes history, but also reflects the character of its present owner, Ariela Cassuto. Ariela has managed to preserve her mother’s rather splendid rose garden, although “rose garden” is something of a misnomer for the explosion of colour growing among and above slabs of rock and clay sculptures. Bougainvillea and hyacinth, different types of roses, and aromatic plants provide an enchanting background to weathered and comfortable garden furniture both at the back and front of the house. Watching the sun set from the front patio is one of the special features at Villa Cassuto and indeed, this entire coastline. The bedrooms have high ceilings and windows overlooking the gardens, each leading to a central hall adorned with family pictures and the villa’s eclectic clutter of books, objets d’art and an equally eclectic art collection. Each room is air-conditioned, although the Livorno breeze is often sufficient to cool down the house when windows are open from every side. By far the most important aspect of staying at Villa Cassuto is the lady of the house, Ariela, and her fiancé, Paolo (by the time this feature gets published, they will be husband and wife). Given that this is a travelogue, we will try and refrain from turning it into a profile of the owners, although separating staying at the villa and interacting with the owners is well nigh impossible. Exceptionally well-travelled, cultured, outspoken, funny, perceptive, warm, generous, larger than life… A wordsmith could go on and on, but nothing would prepare you for the conversational feast – sometimes funny, sometimes outrageous – and contagious enjoyment of life these two have to offer, should you happen to visit at the same time as they are there. We had the good fortune to dine with them at La Bisteccheria, Plazza delle Carrozze. It was an amazing evening with lots of laughter and the largest and most succulent TBone steaks this writer has ever seen, plus a truffle pizza and Tuscan charcuterie. The sangiovese wine selected by our host was somewhat corked, so the staff replaced 3 bottles with perfectly good grace until he approved the fourth. Villa Cassuto is, above all, an unforgettable experience of true Livornese hospitality but also, a glimpse into the lifestyle of an extraordinary couple who are as generous with their food and wine as they are with their life stories. Whether they are in residence or not, just being there would restore your sense of serenity and sheer happiness at being alive and on one of the most breathtaking stretches of the Mediterranean coastline.